Rep. Kurt Schrader has introduced legislation (the Overtime Reform and Enhancement Act, or OREA) that would in two important ways undermine the Department of Labor’s new rule that expands the overtime rights of salaried employees who earn less than $47,476 a year ($913 per week). Rep. Schrader’s bill would delay by three years the rule’s increase in the exemption threshold, the salary level below which all workers are guaranteed overtime pay. The Department of Labor (DOL) rule raises this threshold from $23,660 to $47,476 on December 1, 2016, whereas Rep. Schrader’s bill would gradually increase it to this level by late 2019.1 Additionally, Rep. Schrader wants to eliminate the rule’s indexation of the threshold, which would raise it automatically every three years, as wages for salaried workers rise. Both of these changes would harm the low- and middle-income Americans whom DOL’s rule is designed to help. What would be the impact of failing to index the overtime salary threshold? Rep. Schrader wants to reproduce the very disaster for working people the Department of Labor is seeking to prevent: an inevitable and significant loss of guaranteed overtime coverage due to inflation and wage growth. Failure to adequately update the salary threshold over 1975–2015 caused the share of the salaried workforce that was guaranteed overtime pay to fall from 49.6 percent to just 9.5 percent in 2015 (see Table 1). Had 49.6 percent coverage been maintained, some 26.6 million workers would have been covered, rather than the scant 5.1 million who actually were covered in 2015. Raising the salary threshold to $913 per week in 2015 would have allowed 17.6 million employees to enjoy overtime protection (12.5 million of whom would have newly obtained protection), but it would not restore the level of protection provided in 1975. 9.5% 32.7% 32.7% 0.0 ppt. 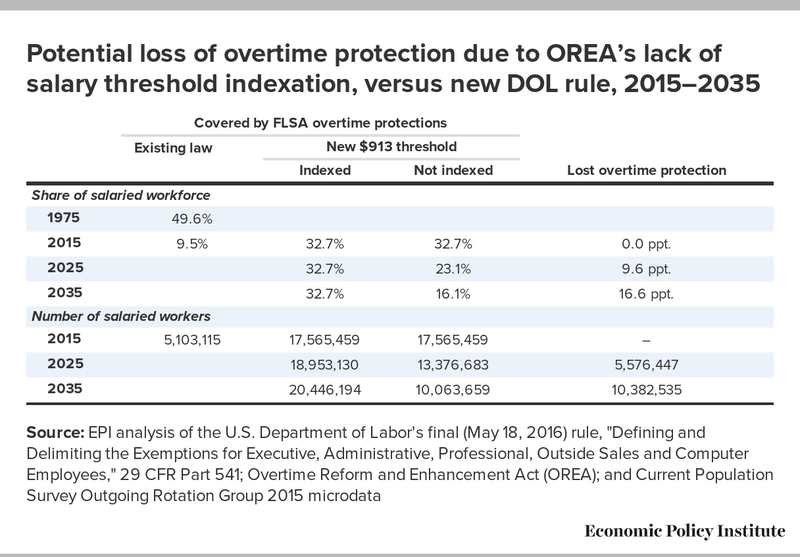 As Table 1 shows, indexing the salary threshold, as provided by DOL’s new rule, allows the share of salaried workers enjoying overtime protection to remain at or near 32.7 percent. The number of workers protected increases as the salaried workforce grows, rising to 20.5 million by 2035. Without indexation, however, the share of the salaried workforce guaranteed overtime pay would decline each year, falling to 23.1 percent in 2025 and just 16.1 percent by 2035. 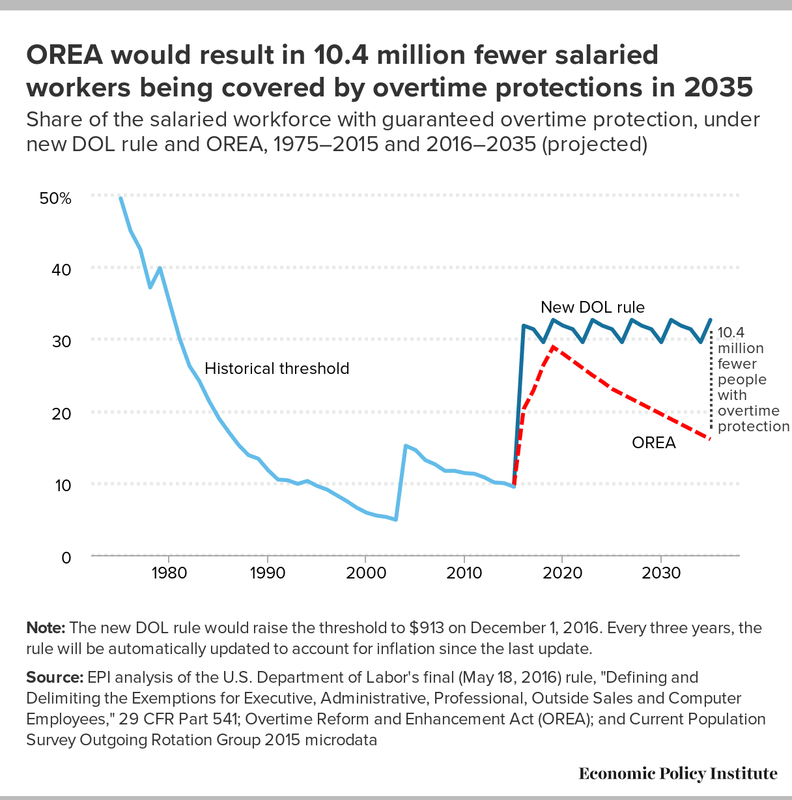 If Rep. Schrader’s bill were enacted, by 2035 there would be 10.4 million fewer salaried workers covered by overtime protection because of the failure to index the salary threshold (as depicted in Figure A). 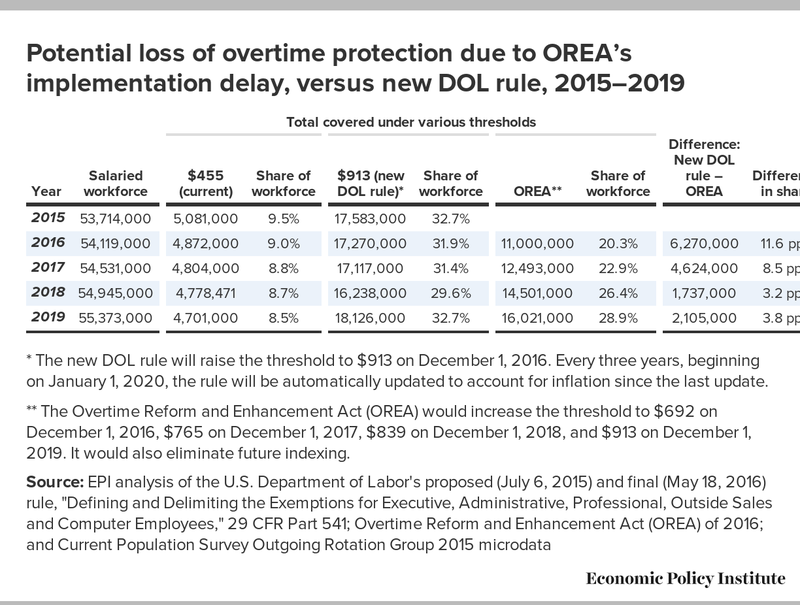 Lack of indexation would cut in half the share of the salaried workforce provided overtime protection, which would fall from 32.7 percent to just 16.1 percent (20.4 million versus 10.1 million). Note: The new DOL rule would raise the threshold to $913 on December 1, 2016. Every three years, the rule will be automatically updated to account for inflation since the last update. What would be the impact of delaying for three years the increase in the salary threshold to $47,476? 54,119,000 4,872,000 9.0% 17,270,000 31.9% 11,000,000 20.3% 6,270,000 11.6 ppt. 54,531,000 4,804,000 8.8% 17,117,000 31.4% 12,493,000 22.9% 4,624,000 8.5 ppt. 54,945,000 4,778,471 8.7% 16,238,000 29.6% 14,501,000 26.4% 1,737,000 3.2 ppt. 55,373,000 4,701,000 8.5% 18,126,000 32.7% 16,021,000 28.9% 2,105,000 3.8 ppt. * The new DOL rule will raise the threshold to $913 on December 1, 2016. Every three years, beginning on January 1, 2020, the rule will be automatically updated to account for inflation since the last update. ** The Overtime Reform and Enhancement Act (OREA) would increase the threshold to $692 on December 1, 2016, $765 on December 1, 2017, $839 on December 1, 2018, and $913 on December 1, 2019. It would also eliminate future indexing. The Department of Labor’s decision to index the exemption threshold has corrected a flaw in the regulations that had devastating consequences for the salaried workforce. Rep. Schrader apparently learned nothing from the history of the rule’s declining coverage—unless he supports that kind of loss of overtime protection. Business groups argue that rule-making can be used to raise the exemption threshold ad hoc in the future, but their worries that automatic indexation might drive the threshold too high has the same remedy. If a future Department of Labor comes to believe the exemption threshold has risen too high and no longer reflects executive, professional, or administrative salaries, it can undertake a notice-and-comment rulemaking process to rewrite this regulation and reset the threshold. But the presumption should be that the modest threshold DOL has set—which protects less than one-third of the salaried workforce—is not too high and establishes a reasonable level of coverage that should be maintained over time. 1. Even then, it will have less value because of inflation between 2016 and 2019. H.R.5813 (Overtime Reform and Enhancement Act), 114th Congress (2016). U.S. Department of Labor. 2016. “Defining and Delimiting the Exemptions for Executive, Administrative, Professional, Outside Sales and Computer Employees.” 29 CFR Part 541.